Happy December, everyone! With December comes a slew of top ten lists of the past year, lists for the next year and book surveys. Our own illustrious Jamie hosts an end of the year book survey at The Perpetual Page Turner every year. So I decided to take part by posting my answers here for your enjoyment! This should be fun folks! Be sure to go check out the survey for Jamie's answers, links to all the other participants and to link your own! I didn't have any five-star books on my Goodread's rankings this year. This isn't surprising, I think I have maybe only ten or less five-star books out of almost 500 read. But I did have a lot of four-stars. And out of those, the book that has stayed with me the most is Paris In Love by Eloisa James (review). It was such a fun look into the lives of a family who picked up and moved to France for a year. It's told in short "facebook status" like paragraphs. It was quite enchanting. Book You Were Excited About & Thought You Were Going to Love More But Didn't? Oh can I go on with this! I think the one that jumps to mind first is Tiger Lily by Jodi Lynn Ansderson (review). I barely got thirty pages into this book before I threw in the towel. I am still baffled by the praise. I guess I was expecting something that the book wasn't. The other one that still makes me sad to think about is Undone by Lila DiPasqua (review). It sounded so good, and I could see a good story in their somewhere. It just wasn't there yet. I am going to take two books in a series and claim them as this answer: Firelight (review) and Moonglow (review) by Kristen Callihan. I don't think I was expecting much when I read these (especially the first), but after reading both I was thrown into a really unique paranormal Victorian world with a new, refreshing take on the romance novels I had been reading. In the real world, I actually have been recommending books to people. I am known as the reader in the office, so when people ask me for recs, I take it super seriously. I have been getting a lot of "I read A Song of Ice and Fire. What should I read next?" to which I answer: The Kingskiller Chronicles by Patrick Rothfuss. The Name of the Wind (review) and A Wise Man's Fear (review) usually are right about what they are looking for... except for the fact that it is another unfinished fantasy series! Favorite new authors you discovered in 2012? I branched out quite a bit in the historical romance genre, which is a big thing for me. Normally when I find an author I like, I spend the next few months reading their backlist. This year was not like that. Always a new author to try. Here is some good ones: Jillian Stone, Heather Snow, Courtney Milan, Julie Anne Long, Kristen Callihan and Meljean Brook. I normally read fiction, so out of my normal genre was Mrs. Robinson's Disgrace: The Private Diary of a Victorian Lady by Kate Summerscale (review). Maybe I liked it so much because it read like a fiction novel, but it was a really interesting look into this woman's life. Rich and going though one of the first divorces? Quite interesting! 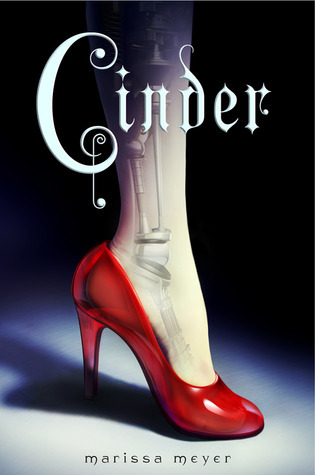 Going to travel to the YA land for this and waaay back to January with Cinder by Marissa Meyer (review). This book was so fun! I devoured this fairytale retelling and can't wait for the series to continue! When does the next one come out...February! Too far! 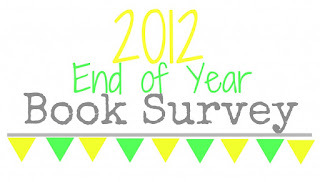 Book You Read In 2012 That You Are Most Likely To Re-Read Next Year? Probably Like No Other Lover by Julie Anne Long (review). I remember really liking that book, but the plot and characters are in my mind now only as faint wisps. That happens with my romance novels sometimes, but I'd really like to read this again. That and though I just read it, I can really see myself reading What I Did For a Duke by Julie Anne Long. It's a tie!! 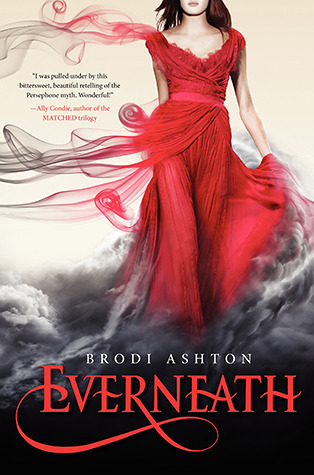 Between Cinder and Everneath by Brodi Ashton (review). I Capture the Castle by Dodi Smith (review). It was a great book that made me think about coming of age in a cold castle during the thirties. It was a good read. Well, A Game of Thrones definitely as I have mentioned... but then also The Iron Duke by Meljean Brook (review). It is probably my favorite Steampunk novel that I have read. And I still have two more in the series to read until I am caught up! Favorite Passage/Quote From A Book You Read In 2012? Shortest & Longest Book You Read In 2012? Shortest: A handfull of novellas all about 100 pages. Slow Summer Kisses by Shannon Stacey (review), A Season for Sin by Vicky Dreiling (review), Winning the Wallflower by Eloisa James (review), The Governess Affair (review) and Unlocked (review) by Courtney Milan. Book That Had A Scene In It That Had You Reeling And Dying To Talk To Somebody About It? (a WTF moment, an epic revelation, a steamy kiss, etc. etc.) Be careful of spoilers! Storm of Swords. Hands down. That's all I'll say. Favorite Relationship From A Book You Read In 2012 (be it romantic, friendship, etc). This one is hard as I fall in love with the relationships of every romance lead as I meet them (aka read their story). I actually don't think I could do this. It would seriously just be a list of the romance novel's I read this year ha. Favorite Book You Read in 2012 From An Author You Read Previously? Thief of Shadows by Elizabeth Hoyt. I love the series this book is in! A super awesome twist on normal historical romance (meaning not primarily set in the ton and not in the Regency). But I love the writing style, the steam, the everything!! One Book You Didn't Get To In 2012 But Will Be Your Number 1 Priority in 2013? Everything on this list. Seriously. If I had to chose one off of it, Ender's Game. I'll keep it down to two. Shades of Earth by Beth Revis and Winterblaze by Kristen Callihan. Both thirds in a series. Can't wait! 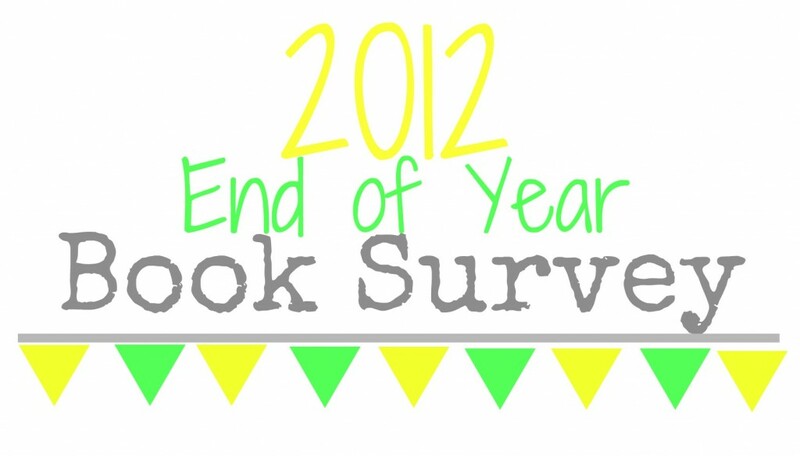 One Thing You Hope To Accomplish Or Do In Your Reading/Blogging in 2013? One hope and dream I have is to get back to reviewing things immediately or really soon after I finish them. If I don't do this, then my Goodread's reviews sit empty and I have less to post here. I enjoyed your end-of-year summary! It's so much fun to look back and analyze what we accomplished in our reading an to look ahead. You found lots of new authors, great stuff. I haven't done my answers to this yet, but I loved reading yours. I agree completely with every Storm of Swords mention too - I was DYING to talk about it, but my boyfriend is really far behind, and the spoilers would just be cruel! I've just started A Dance with Dragons and all I will say is DO NOT READ THE BLURB YET - seriously, so many spoilers. I've had to really watch where I leave my copy around the house. STORM OF SWORDS!!! I just finished that one last month. I can wait to season it in Season 3. I had the same problem with the George RR Martin books! My husband is still not finished with Book 3 and he NEEDS TO FINISH so I can talk to him about it! There were times when I just stopped, looked up at him, and said, "Holy....!" And, yes, read Ender's Game asap. It's one of my favorite books ever. EVER. Tiger Lily! I have to say I agree with you. I had lukewarm feelings on it as well. I did finish it, and I felt it did get better with time but it didn't grab me like it did for other readers. I'm also surprised by the praise but I feel like it's a book people should read still. Maybe just for use of an MC and as another version of PP. My husband has been obssed with George RR Martin, and is anxiously counting the days until his semester is over so he can continue on. ;) Maybe they should start a support group for this...?